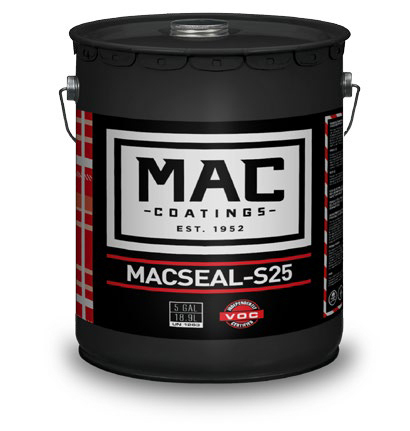 Woollatt Building Supply carries MAC Coatings which manufactures a full line of products for concrete applications. Whether you’re curing fresh concrete or enhancing the properties of a decorative substrate, we can service all of your concrete coating needs. has impacted VOC regulations, restricting the solvents that manufactures can use in concrete coatings. Before these changes, there were numerous solvents available to enable sealer manufacturers to provide user friendly products for various concrete applications. Our line of sealers are clear, available in natural, semi, and high gloss forms. MACSEAL was designed to protect stamped concrete, paving blocks, poured concrete, interlocking stone, exposed aggregate from water, oil and grease, chewing gum, etc. Due to a proprietary blend of solvents, this compliant sealer behaves and applies like a traditional xylene based product, while providing superior performance. MACSEAL contains a synergistic ultraviolet inhibitor system which greatly increases the life of the coating. This product gives a glossy lustre to masonry surfaces which is further enhanced with a second coat. This product complies with current maximum VOC content limit of 400 g/L for concrete sealing compounds. 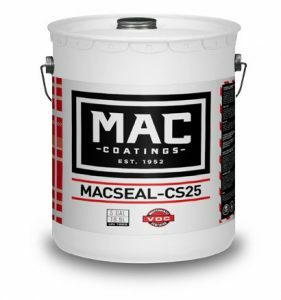 Our line of Cure & Seals, MACSEAL CS, are clear curing compounds available in natural, semi, and high gloss forms. Our Cure & Seal was designed to provide a premium seal on freshly poured concrete. The primary function of this line is moisture retention, and it can be applied in any situation where simultaneous curing and sealing is desired. It can also be used as a concrete sealer on existing concrete when a soft gloss finish is desired. When properly applied, this compound reduces the common defects that result from a concrete that has not been properly cured such as dusting, premature cracking, etc. Our Cure & Seal also provides concrete with protection during construction. This product complies with current maximum VOC content limit of 350 g/L for concrete sealing compounds. About MAC Coatings: MAC Coatings is a premium coatings manufacturer located on the Michigan border in Windsor, Ontario, Canada. With more than 60 years of serving the industrial, manufacturing and commercial markets, they know producing quality products and delivering high levels of customer service are the pillars to their success. Working with their business partners to provide coatings solutions is their passion. This link will open in a new window or tab.